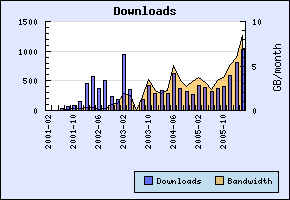 Finally, I want to mention the overall download count for kfile_chemical was is much higher than I ever would have hoped for: 1125 in 7 months! Maybe I should ask to get this in the KDE extragear. The latter involves getting the CdkJmolAdapter, the interface between the CDK and Jmol, updated for changes since the Jmol as 3D viewer for CDK article in CDK News, the open access journal for CDK related projects. The screenshot is not showing the actual status: the CdkJmolAdapter does not propagate all information to Jmol correctly; as you can see in the screenshot in the BioPolymerTree and Property views, the CDK now reads the structure information from the PDB file, and I verified that Jmol really extracts this using the StructureIterator, but the secundairy structure does not show up yet. I believe the problem is in the AtomIterator: issueing the 'select protein' script, selects zero atoms. The above screenshot is using a workaround, and was made by using Jmol's own IO instead of the CdkJmolAdapter. But I'm very close and think I will be able to fix this soon. The data classes of the Chemistry Development Kit are mutable, unlike those of Octet. This means that other classes may need to respond when the content updates. For example, a render class. CDK's ChemObject provides a notifyChanged() and addListener() methods for this. However, as was recently pointed out, while this is useful in editors, such as JChempaint, this is a performance killer in high-throughput sitations, such as descriptor calculation, or structure diagram generation runs. To address this, the IChemObject interface has been extended with the methods setNotification(boolean) and getNotification(), which allow to temporarily disable change notifications. There are no helper methods yet to disable it for a complete data structure, like ChemModelManipulator.setNotification(ChemModel, boolean), but I expect these to be written soon. The advantage is that you do not have to manually disable notification for each class you instantiate. This should give a considerable speed up, and I hope soon to give some statistics. Bioclipse 1.0 is to be released in May, and the cartoon on script command is still not working in the Jmol viewer. 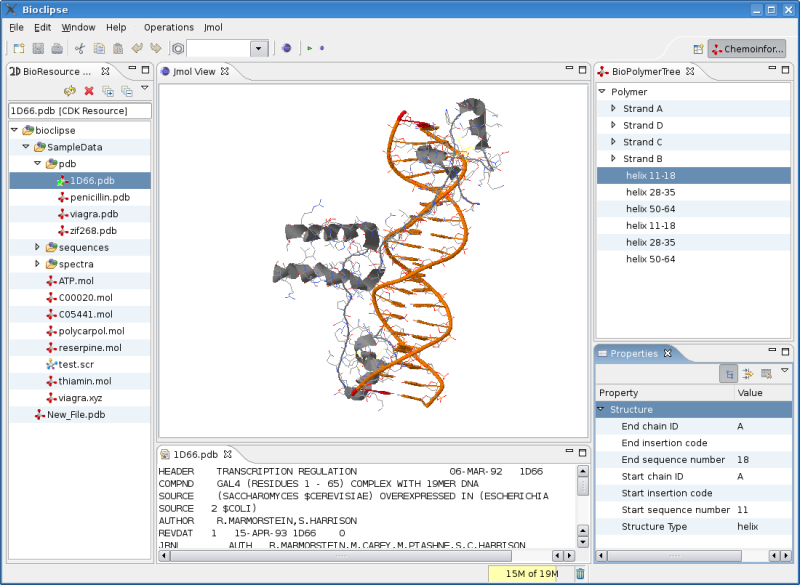 For those who do not know yet, Bioclipse is a cool Eclipse RCP based Java chemo- and bioinformatics workbench. To have a better idea what goes on inside Bioclipse, I wrote a new BioPolymer tree to show me the strands in the protein. After Ola wrote code to show properties for IChemObject's, I extended did with PDB properties for the atoms, strands and monomers. So I'll have to dig a bit further. The Self-organizing map (SOM) is a popular (again) and intuitive non-linear mapping method: it transforms a multidimensional space into two dimensions (normally: they are so easy to visualize). Latino and Aires-de-Sousa published a paper that uses this method to analyze the whole KEGG pathway database: Genome-Scale Classification of Metabolic Reactions: A Chemoinformatics Approach (DOI: anie.200503833). The method is based on earlier work by Zhang and Aires-de-Sousa: Structure-Based Classification of Chemical Reactions without Assignment of Reaction Centers (DOI: 10.1021/ci0502707). A non-trivial feature of the suggested method is the use of two SOMs. The first maps the reaction onto a fixed-length vector (coined MOLMAP), which is used as input vector for the second map. This later map is used to cluster the KEGG reactions on a purely chemical basis. The resemblence with the EC numbering system is striking. Update: Fixed DOI link and added Technorati tags. While I was working on implementing proper author-given chain IDs in PDB structures for Jmol's mmCIF reader today, I thought it was interesting to mention the recent article Traditional Biomolecular Structure Determination by NMR Spectroscopy Allows for Major Errors by Nabuurs (DOI: 10.1371/journal.pcbi.0020009, open access), working at the CMBI, two floors away from my former working location at the Radboud University Nijmegen. Nabuurs discusses in this article the uncertainties that come with NMR derived 3D molecular structures of proteins. These studies do not give factual data on atomic coordinates, but generally give facts about interatomic distances. Solving the 3D geometry is then an optimization problem where the task is to find the 3D geometry that best reproduces the factual interatomic distances. Now, this optimization has many closeby, i.e. in terms of matching the experimental data, minima, corresponding, possibly, to quite different structures. It is interesting to note that 1TGQ got replaced by 2B95 about the same time the article by Nabuurs was published, which shows a 3D model that is homologous with that of 1Y4O, and different from that in the Nabuurs article. Internet has the nice feature of bringing together people. This has helped many open source projects in the past. But it is also a convenient and cheap way to have conferences. Next month, the ChemConf 2006 conference will be held, and interested people only need to subscribe to a mailing list to participate. The topic of this years ChemConf is Web-Based Applications for Chemical Education. 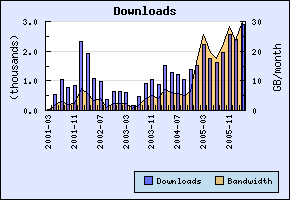 At least three posters will show the use of Java applets in chemistry education, using Jmol, JChemPaint and JSpecView. I am (co-)author of two of them. Again, participation is free. So join in!